"Which new features in Oracle Database are you currently finding most valuable? 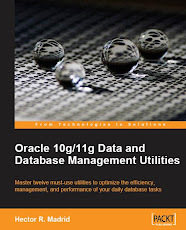 Oracle Automatic Storage Management and the Volume Manager. Another nice feature is Secure Files, which improves performance, optimizes storage, and provides an additional security layer. What advice do you have for those just getting into application development? When designing an application, seriously evaluate the amount of intelligence it’s going to manage. This will define the amount of coding, complexity, round-trips to the server, and scalability. And be aware that the application user is different from the big database user. Tell us about your role with Oracle University (OU) and the value you see in this program. I’ve been a certified OU instructor for more than 15 years, and I really believe that an OU course is the best way to get acquainted with Oracle technology. The courses provide a good balance between theory and practice, and professionals can start being productive the day the course concludes."